In France, frozen food doesn't seem to have the same degree of stigma as it has over here. Indeed, while we have Iceland, famed for its turkey twizzlers and pepperoni lasagnas, France has Picard which is an altogether different beast. Delicious canapes and pates, perfect little amuse bouches and our annual Christmas chapon are among the treats to be found. A recently discovered family favourite is their mushroom soup, which thanks to an excess of food at the end of Christmas made it back to England. I looked at the back of the pack and the ingredients were as follows: Champignon de Paris, eau, pomme de terre, oignon, crème fraîche, carotte, céleri rave, beurre, sel, ail. So I decided to try and see if I could recreate it myself. The recipe below makes an awful lot of soup - enough I would guess for 12 people. So if you can, I would suggest freezing half. If you freeze it in an ice cube tray and then decant the frozen cubes to a freezer bag, you can have individual portions of soup as and when you want. It is, however, an absolutely delicious soup, so is entirely worth the glut! Begin by peeling and chopping the onions,carrots, potato and celeriac - I cut everything into rough 1.5cm dice. Gently fry all the diced vegetables and the garlic in a heavy bottomed pan with a little olive oil for about 5 minutes, until the onions are translucent, then add the chicken stock, (or vegetable stock if you wish to make it vegetarian) thyme, salt and pepper and simmer for 20 minutes. Just after you've added the stock to the vegetables, soak the porcini mushrooms in hot water for 20 minutes too. While the vegetables are simmering, roughly chop and flash-fry the chestnut mushrooms, then add to the simmering vegetables. Finally, once the porcini are soaked, add them and their liquid to the vegetables. Next, in batches, puree and push the soup through a sieve before transferring back to the heavy bottomed pan. Finally, stir through the crème fraîche. 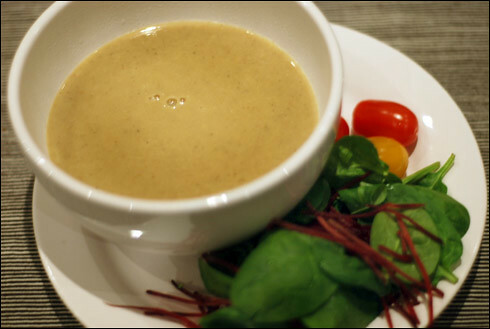 When you are ready to use the soup, take care not to let it boil as the crème fraîche will curdle.